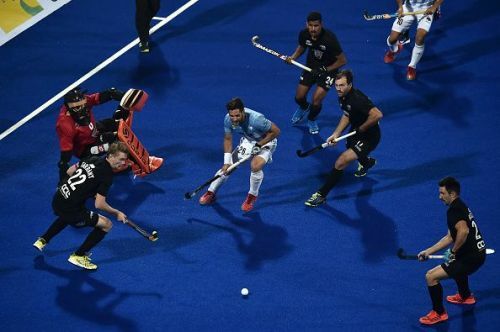 Bhubaneswar, Dec 3 (PTI) Olympic champions Argentina lived up to their billing and beat New Zealand 3-0 to inch closer towards a direct quarterfinal spot at the men's hockey World Cup here on Monday. Argentina were the better side on display as they created more chances and scored thrice through Agustin Mazzilli (23rd), Lucas Villa (41st) and Lucas Martinez (55th) to pocket full three points from the Pool A encounter at the Kalinga Stadium. By virtue of two wins from as many games, Argentina are atop Pool A with six points and they have brightened their chances of a direct berth in the last eight round. New Zealand are at the second place with three points from two games ahead of Spain and France, both of whom have one point each. Argentina had earlier defeated Spain 4-3 in their tournament opener while New Zealand had beaten France 2-1. While Argentina will play world number 20 France in their last pool match on December 6, New Zealand will be up against Spain. Argentina started the proceedings on a bright note and got the first scoring opportunity of the match in the fifth minute in the form of a penalty corner but they wasted the chance. Barring this, it was a dull opening quarter which witnessed a midfield slugfest. A minute into the second quarter, Argentina came close to taking the lead but Lucas Villa's try from close range was kept away by New Zealand goalkeeper Richard Joyce. New Zealand got their first opportunity in the 18th minute when they were awarded a penalty corner but Kane Russell's flick was saved by Argentina custodian Juan Vivaldi. Seven minutes from halftime, the Los Leones finally broke the shackles when Mazzilli scored his third goal of the tournament. An inch-perfect defence-splitting pass from Gonzalo Peillat found Mazzilli unmarked inside the New Zealand box and the striker first controlled the ball and then sent it crashing into board with a reverse hit. That was all the first two quarters produced as Argentina went into the halfway break with a slender one-goal lead. Argentina continued their dominance after the breather and secured two penalty corners in the first five minutes of the third quarter but drag-flicker Peillat witnessed an off day in office on Monday. But it did not take too long for Argentina to extend their lead through Villa, who slotted home in the 41st minute after snatching the ball inside the box from the sticks of New Zealand skipper Blair Tarrant. Trailing by two goals, New Zealand pressed hard in the fourth and final quarter and secured their second penalty corner but the Black Sticks made a mess of the chance. Five minutes from the final hooter, Argentina got their fourth penalty corner and Martinez scored from a rebound to shut the doors on New Zealand.